A wonderful, hand-painted model of the fearsome predator Postosuchus. A huge meat-eating reptile that ate dinosaurs. Great for imaginative, creative play, part of the Wild Safari Carnegie Dinosaur Collection. A hand-painted, highly detailed model of the fierce predator Postosuchus. A super, scale model of the Triassic meat-eater Postosuchus. Replica model is part of the Carnegie Safari Wild Dinos collection and is supplied with fact sheet written by the experts at Everything Dinosaur. This Postosuchus replica is absolutely Incredible. No pictures do it justice hodling it in your own hands you see just how much detail is on it and its beautifully done. I highly recommend this Dinosaur predecessor to your collection. Postosuchus received and one more time fantastic service and prices! very nice model good colour size and details. My first safari ltd model, and it was always my favourite creature from walking with dinosaurs. Wow! This model has to be one of the best quality prehistoric animal toys on the market! Superb detail and beautifully painted. Gives a very good impression of a living animal. I’ll certainly add more of these fabulous Triassic reptiles to my collection. This one truly is exceptional! Note quite as impressive as the Kaprosuchus, but good nonetheless. Kind of sinister looking. amazing model of the top triassic predator postoscuhus. brilliant model. Wow! This model is one of the best I’ve had the fortune of owning! It is extraordinaryly detailed and has an amazing colour pattern! This is one of my favourite models in my collection, and would HIGHLY recommend this figure. Its amazing! This figure sculpt is amazing. Very well detailed, the teeth are incredible. The pose is a pacific walking. It resembles so much its counterpart of “Walking with Dinosaurs” show. Its colors are very nice and realistic. Paintwork in my particular figure is not well done, there are many flaws in the entire right side. The conclusion: A beautiful piece. I received my Dino and i was so impressed with it .. when i got it . it was better then i imagined it would be and the postage was very fast. A daring choice with this non-dinosaur figure. Safari LTD’s sculpting and painting at their best ! This is my son’s favourite creature from Walking with Dinosaurs and I was beyond thrilled to find it for sale as I never thought I would be able to get one. I can’t wait to give it to him as one of his many dinosaur themed birthday presents soon and know that he will be totally delighted. It is superbly detailed and exactly the right size. Thank you so much ‘Everything Dinosaur’ for selling and delivering it so quickly. 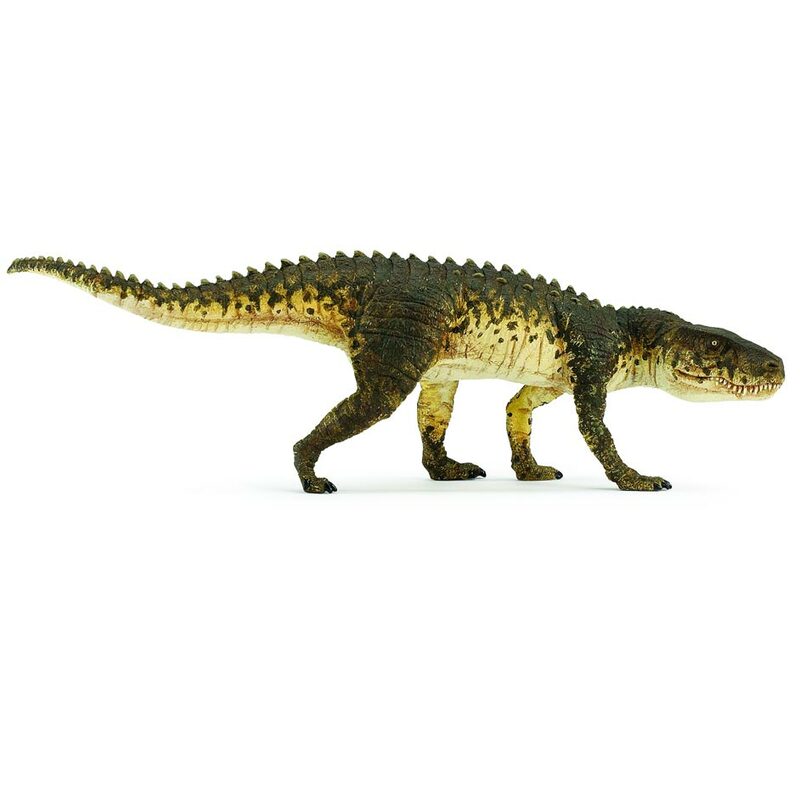 Postosuchus made famous by the BBC “Walking with Dinosaurs” is a must have figure.